Finding the perfect Christmas gift (or birthday present) for any child can be a daunting, confusing, and sometimes dangerous endeavor (have you ever been to Toys”R”Us this time of the year!?) But what about buying a Christmas present for a baby born with Down syndrome? Are there special toys for these special kids you may be wondering? (spoiler alert: there aren’t.) You may be worrying about offending a parent of a child with special needs by giving their child a toy that is to advanced for their developmental skill level. Or maybe you’re the new parent of a child born with Down syndrome trying to find the best toy for your kid-o! No matter who you are, or whose child your purchasing a gift for, this holiday season I’m here to help! First I hope you are already giving your child the 3 free gifts that any child would like better than an iPad. Second, I want to give you some general advice for purchasing toys; not only for children born with special needs, but for all children. If you’re in a hurry feel free to scroll down and check out our top ten Christmas gift ideas for babies born with Down syndrome at the bottom of the page. 1. Follow the age recommendation on the box…just like you would for any child. I’ll be honest, before Noah was born I had no idea how to buy a Christmas gift for a special needs child. (Pretty silly, I know.) I would have been super worried that I was going to buy something too advanced for their child. I’d be embarrassed and they would be offended. I would have thought the age suggestions that are clearly printed on the front of any toy box only applied to typical children. Boy, I had a lot to learn. Children born with Down syndrome like Christmas presents, birthday gifts, toys, and lots of fun just like any other child. A baby not liking fun baby toys would be weird. 🙂 Being born with Down syndrome means you have 3 copies of your 21st chromosome. It doesn’t mean your weird. Here’s a quick pro toy buyer tip: When in doubt just stick to the manufacturer’s age recommendation’s printed on the front of every box and you’ll be just fine. 2. The more it flashes, lights up, beeps, chirps, sings, dances, etc….the better! We’ve been on this journey for a year now and during that time we’ve brought MANY toys for our child who was born with Down syndrome. Some good. Some bad. And some we have kept going back to time and time again. If you are looking for a Christmas gift, birthday present, or a “I’m your grandma and just want to spoil you rotten gift” for a baby born with Down syndrome (or any child 0-12 months old) it’s my pleasure to present to you the following list of toys that made it to the top of our “awesome toy stack” this year. I hope you find it helpful. The Fisher Price Crawl Along Snail was one of the first gifts Noah’s grandmother bought for him, and he still enjoys playing with it. This would make a perfect Christmas present for any child under one year old. 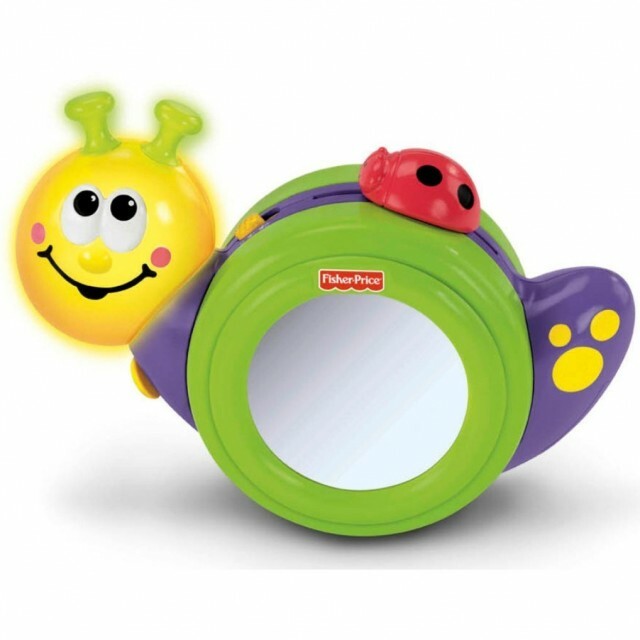 A few of Noah’s favorite things about it are its fun light up face, the catchy songs it plays, and the mirror. Mirrors are great developmental tools, and babies benefit (and have a lot of fun) spending hours looking (and kissing!) their self in the mirror. 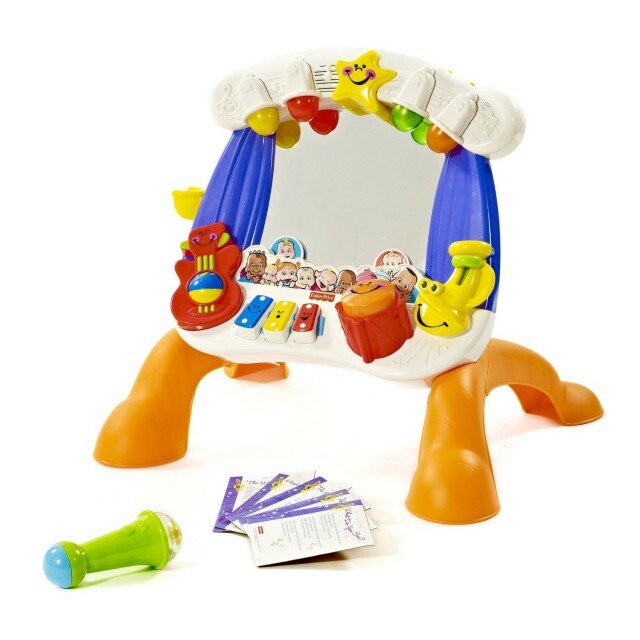 The Fisher-Price Laugh & Learn Fun with Friends Musical Table is a toy that grows with your child. All of the major toy companies make musical tables like this one, and we did a lot of research before buying this one as a gift for our son. The reviews on this one were better than all of the others we say, and I feel like the variety of activities you get with this one are more fun than all the others. Here’s a video of Noah having some fun with it! What I like the most about this are the detachable legs. We were able to take them off and sit the table on the floor for Noah during tummy time, than again as he was learning to sit up by himself, and now that he is learning to stand we have attached the legs so he can pull himself up. Win! Win! Win! If you are looking for a great musical (developmental) table to buy as a gift you can’t go wrong with this one! 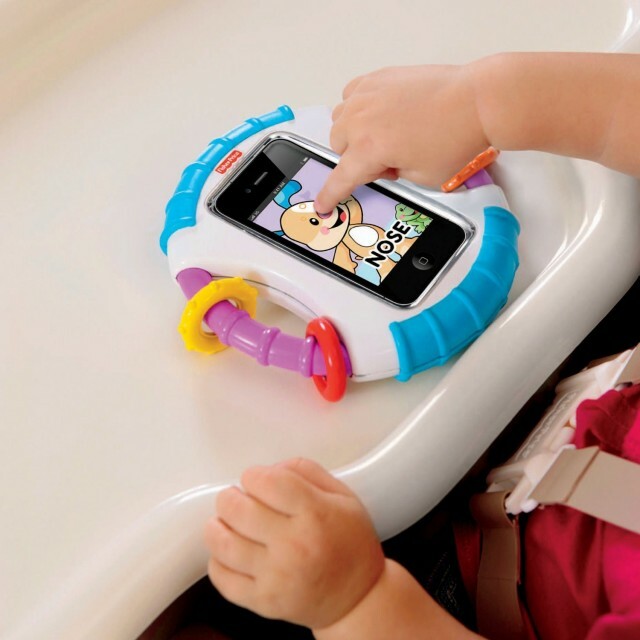 I was hesitant to include the Fisher-Price Laugh & Learn Apptivity iPhone Case on this list of great Christmas gift ideas because you have to have an iPhone (or iPod touch) to use it, but it’s so much fun that I couldn’t leave it off! This iPhone / iPod touch case for kids is especially great because it comes with 3 free iPhone developmental apps that are a ton of fun! Another great thing about this iPhone case is that you don’t have to worry about your precious Apple product getting damaged because it’s completely protected in its own little baby friendly vault! Totally safe from slobber, buggers, snot, runny noses, or anything else your cute little baby may throw at it. It’s great! (It also has a mirror which I really like!) It’s fun for road trips, and even with no phone in it Noah still likes to chew on it, and look at his adorable face in the mirror! 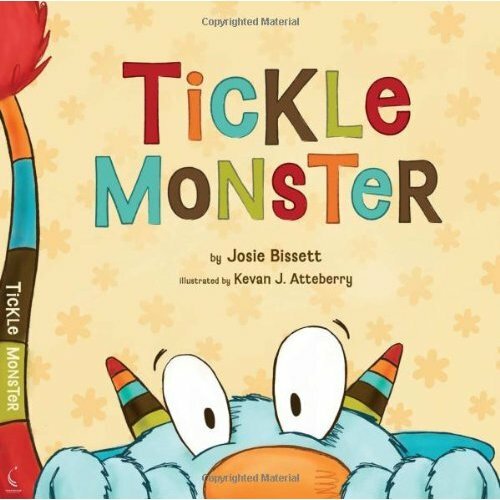 Kids (and their parents) are always on the look out for fun new books, and The Tickle Monster would be a great one to add to their collection! I encourage you to take a second to read about the top 3 reasons why The Tickle Monster is one of our favorite children’s books. If you don’t have time to read that post I’ll just say that this book is interactive. You don’t’ just read it to your kids, you read it with your kids. The Tickle Monster allows a parent to create some awesome memories with their children, and so while the book in and of itself is great, it’s so much more than just a book. It’s an experience. And experiences help you win with your kids! 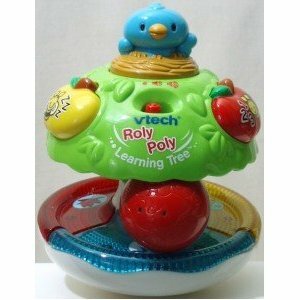 The Vtech Roly Poly Learning Tree Toy is an older toy, but thankfully if you look around hard enough (or check out the link above) you can find one. With so many great toys that you can simply walk into any store and purchase you may wonder why I would include one that isn’t as easy to find? Because it’s that good! I don’t’ know what it is about this toy that’s so great, but Noah can’t get enough of it. It’s almost always in his crib. He enjoys the songs, the way the apple moves around the tree, the multiple bright lights; he can’t get enough of it! I’d highly suggest checking out the link I posted above to buy it from Amazon, or check out your local thrift store. It may not be as easy to find as simply walking into your local Babies R Us, but I promise you it’s worth taking the time to find it! Any baby would be happy to find this present under their Christmas tree! Noah’s physical therapist has been using the Fisher-Price Little Superstar Sing-Along Stage with Noah for a while now, and my wife was lucky enough to find one used (and at a great price!) at our local Once Upon A Child (A baby 2nd hand store.) In fact, this may be Noah’s favorite toy right now. He just started to learn to pull himself up now, and every time he sits in front of this toy that’s exactly what he wants to do. (I can’t wait to share one of the videos I took of him first pulling himself up to a standing position on this toy. His entire face light up with excitement and pride! It was awesome. I’m so proud to be this little boy’s father!) I’ll be posting one of those videos in a few weeks, but until then I’ll tell you that he especially likes the huge mirror and all of the bright fun lights! If I were buying a toy for a child with Down syndrome (or any kid for that matter) who was 10 months old – 18 months old this would be the one…without a doubt! Last, but certainly not least, are the Fisher-Price Brilliant Basics Baby’s First Blocks . We have used these blocks more than any other toy during Noah’s occupational therapy visits as they also double as fantastic developmental toys! They started out by having Noah just hold the blocks (to work on his grasp), then they had him work on grabbing the blocks out of the box. After that he was able to hold a block in each hand and bang them together (another developmental milestone), and now at 12 months old he sits they often have him sit on an exercise ball while he turns his body, grabs a block out of the box, transfers it to his other hand, turns and grabs another, and finally bangs them together. I could on and on about other creative and fun ways we’ve used these blocks, but without a doubt these blocks should be one of the first gifts any baby receives. I hope this list helps any of you out there who are looking for Christmas gift ideas for babies with Down syndrome (or for any baby 0-12 months! ) There are a ton of great toys and gift ideas out there and this list is by no means comprehensive. Although all of the gift ideas on this page are ones that our son has personally used (and enjoyed) this past year. Oh, and one more thing: Our son is only 12 months old, so the Christmas gift ideas on this page are for children 0-12 months old (although some of them can be used for children up to 36 months old). If you are looking for other gift ideas Toys “R” Us has a fantastic Differently-Abled Toy Guide on their website. If you haven’t checked it out, it’s great! You can search for toys by certain developmental areas, age ranges, and a variety of other ways. Additionally be sure to check out our post on the best developmental toys for a child with Down syndrome. Take a second to leave a comment below and let me know any that I’ve missed (I want to hear what some your favorites are!) your experience with any of the gift ideas on this list, and if you ended up purchasing any of the ones I suggested. Please be sure to leave your email and stay up to date on our newest posts. This season of life has been very crazy for us for a number of reasons, but hopefully things will be slowing down after this week and we plan on working very hard to get caught up. We have a lot of really exciting things to share, and I can’t wait to share them! Joseph sounds a lot like Noah…he can’t get enough music, and lights. It’s so much fun. I can’t what to hear what you think of the dino walker when I get a chance to post it. Thanks so much for staying connected with us! We are excited to be on this journey with you. Thanks for the tips! These toys look excellent, and I so appreciate that you have already done the research! Now all I have to do is remember to check this list again before buying Nolan any more toys! What are some of Nolan’s favorite toys? He’s only 4 months old, so he hasn’t really had much experience with toys yet, but right now his favorite thing is the Christmas tree lights and candles! He loves his Sophie giraffe, too! We hope you guys have an awesome CHRISTMAS! We are glad to be on this journey with you guys, and the change to learn more about your family. Great ideas! Man, I wish you would have posted this about 3 weeks ago! Soooooo needed this 3 weeks ago too but but but it’s great to see some of my research matches your research. Phew!!!!! I love this list and so appreciate it! You rock! I’m sure you found some awesome Christmas gifts, and I’ve enjoy hearing what you found! Also how old are the little ones you are shopping for? I think that I might be the only person that does not agree with some of this post! I agree that we need to buy toys that are for the age of our kids, but I do not agre with buying toys that light up an that are loud and flashy. I have been told by many therapists, including my speech therapist, my support worker and my ot that these toys can hinder speech delvelopment and other skills. Flashy toys are ok in moderation, but our kids should be playing with traditional toys that encourage Imagination and play and speech development. These cause and effect toys are not doing any help, they don’t teach anything, they teach to push a button and something will happen. I have a few toys like this an while I do let my ds daughter who is almost 2 play with them, it is not all the time an they are not that loud. For various reasons they should be only played with in moderation. Good toys to buy that encourage play and speech development are books, blocks and toys that are not cause and effect. Thanks for sharing. I agree with the part about finding ways to engage our children and help them develop their sense of wonder. I’m not sure how long you’ve been following our story, but we are all about having fun, and being creative. If you were to walk into our home at any given time the chances are we’ll playing with some interactive toy with Noah, reading to him, making up silly stories, and crawling all around house playing “dinosaur.” Heck, we even find creative ways to play with the cause and effect toys in ways that evolve him doing more than just touching with it. I would very much disagree with who ever is telling you that these toys aren’t helpful to children 0-12 months old. My wife is a pediatrician, and Noah goes to 4 therapy appointments a week at one of the best children therapy centers in the world…and most of these toys are used there. But like anything, variety is the key. We like to mix things up with Noah all the time, and almost never is he simply just lying around with a toy all by himself. 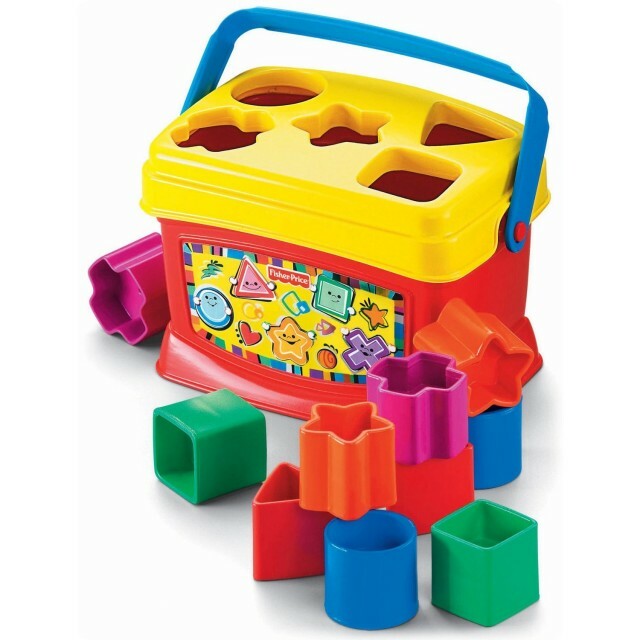 What sort of toys did your child play with between 0-3, 3-6, 6-9 months old? Maybe you could suggest some that you enjoyed. By the way, that picture is just the cutest picture EVER!!! Thanks for the list! I hope you do this every year! Thanks! I’m glad you enjoyed it. And our plan is to do one every year as Noah grows up. Hahahaha that’s awesome! It sounds like you guys have tons of fun at your house…I love it! we have four of the toys you suggested. the only one i wouldn’t recommend is the snail. it’s boring and doesn’t hold rachel’s attention. she does like the mirror on it but you can buy just a mirror. the most versatile toy is the laugh and learn table. she is over two and is just now over playing with it. it helped with tummy time, it helped with sitting, kneeling, pulling to stand, standing and walking. it helps with fine motor as well. i think she’ll be more into it again once she starts reading/talking and can actually do more things on it but the music part. it’s in storage to bring out for our son when he is ready. totally worth the money. You guys didn’t like the snail!?! Bummer, that’s one of Noah’s favorites! 🙂 He likes to lay it down flat on the floor and spin it around and around…did you guys try that. He gets a kick out of seeing that tail go in circles. I agree, the laugh and learn table is a great value! Although the sing along stage is a very close 2nd…..and even first place for a baby that is around 9-14 months or just starting to pull himself up. Noah likes the HUGE mirror on it, and it seems very easy to pull up on. Do you guys have any other favorites? First, I REALLY like the name Krill…very cool! How did you guys pick that name? Is there a story behind it? 2nd, thanks for all of the great toy recommendations! I want to check out all of them. And the Jigglers Oral Massagers…I need to check these out also. We’ve been looking for something Noah can chew on that vibrates…we haven’t seen any good tethers that do this. He has a Z-vibe that we use for speech development, and he enjoys chewing and playing with it! haha. What do you like about it? How old is Krill? Does he find it was to bang on? Hi, my son who happens to also have down syndrome is nearly 11, although his play skills are around the 12 month level. Physically and behaviorally I’m wondering if he could now use an ipod with the help of the holder, so may have to buy and try. He also would maybe now try the ride on, however he would now be too heavy and big to fit, which I find is a shame as he outgrows things before he even has a chance to want/try. As for the others he doesn’t enjoy toys that light up, make sound, move etc. I haven’t done much research on this, so take this with a grain of salt. Have you tried the Radio Flyer’s? They have a bunch of ride on and trikes that are roomy enough for even my husband to ride on with my son at the park. (there’s a park in our local area where a lot of people leave their outgrown toys, so it’s filled with all types of ride ons. we love to go here so Kyle can learn to ride a bike or trike before we invest in one that he likes). This particular one looks like it might be roomy. But again, I haven’t seen it in person yet. I don’t know how big your son is, but it says it accommodates 42 lbs. Good Luck! Every kid needs to have a big of some sort, I hope you find one that works for you and your budget. Was your son born with Down syndrome? Also, the iPod case hold I mentioned on that list is really good, and the half rings on the sides could perhaps be helpful for him as he tries to hold it. What sort of things does your son enjoy doing? Where are you guys from? I am just curious… why did you ask if her son was “born with Down syndrome”? I thought all people with Down syndrome were born with it. Is there some other way a person can get it? Very awesome! I think out of all these toys it’s neck and neck between these block and the LED Color Want between what gives you the best bang for the buck. But the older Noah gets, the more I see how much ‘shelf life’ these blocks have. He is one now and has been using these blocks in therapy for so many different activities. We have a ton of videos posted of him using these blocks, and will be posting tons more soon! I have to mention Elf on the Shelf. Noah may be a little young for this book this Christmas but plan on getting it next year. If you like Tickle Monster you will love this. It is a book that comes with an elf. He “moves” every night and the kids have to find where he moves to in the morning. The story book states that he watches the kids and flies back to Santa to tell him how everyone is behaving. My children, from 11 years old down to 15 months love looking for him each morning. He comes out Thanksgiving night and returns with Santa to the north pole on Christmas night. My 15 month old has actually found him the last four mornings in a row before anyone else. She doesn’t talk yet, but points at him and yells when she finds him. Oh yeah and they are not allowed to touch him or he loses his powers. Great tradition to start with Noah next year – check it out at the bookstores. Thanks for your comment, but I know all about the elf on the shelf! I could write for days on this, but I think the idea of someone always looking to catch kids doing bad (or good) and than reporting it to someone, who then in turn rewards them (or takes away rewards) based on their good (or bad) behavior, is very dangerous. I’ve worked with teenagers for over a decade, and many kids (and adults as well) view God in the same way. Always looking to catch you doing something wrong, and if you’re good, God will do good things for you, but if you’re bad, God will do bad things, and keep things form you. Which of course is a very theologically inaccurate view of God, and his attitude toward us. Hopefully ou know me well enough to know I’m all about fun, and not one to make big deals out of fun things…I just like to be careful with these sorts of things as they teach our children concepts at a very early age. I want to be sure those concepts are true…if that makes sense. Understand your point completely. In our house, we never use it to hang over their heads it is all about the game of finding him the next day. Regarding the elf watching, I believe that God is always watching all of us. Not to punish us for “misbehaving” but to hopefully point us in the right direction. I certainly believe that God loves all of us (good and bad) just may not always like choices we make. I do understand why you find it creepy – sometimes the children do think his eyes move! Would make a great Twilight Zone episode!! Tracy – I just saw an interesting new bicycle that perhaps your son would like. it is called a jobike. A father invented it and it is a bike with no pedals so the older children or adults can use it similar to a ride on toy. Google jobike to check it out. Or wonder if you could just tinker with a used bike and remove the pedals to try it out? Thanks Margaret, he really needs one of those adapted bikes, he has no balance or co ordination and has visual processing problems. They are just so expensive and there’s always something else he needs. I managed to get him an oversized tricycle a year or so ago. He never bothered with it and now he’s looking he’s too big and heavy. Thanks again though. Do you have any links to those bikes you are talking about? I’ve never seen on myself, and I’d be interested to see it. In the comments, a lady was mentioning that her oldest child who weighed 170 lbs could play on this ride-on. Maybe your son would enjoy it. I was really interested to read this. A friend of mine posted it to her Facebook wall. I stopped reading after you wrote something along the lines of A baby not interested in baby toys would be weird. Kids with down syndrome are not weird. Well, I have a kid with autism and I don’t think he is weird but lots of kids with autism never play with toys. Even as babies. I feel very fortunate that my son is very high functioning and he does play with toys in an appropriate fashion but the statement still rubbed me the wrong way as I watch other kids in our autism community have to learn to play with toys and fear that other children might just call them werid and hurt their feelings. Especially as a fellow special needs parent- I’m just surprised by that sentence. I know it is a matter of semantics and some people probably wouldn’t mind this but there are other disabilities out there besides DS and we all need to stick together and not throw out terms that can hurt. Thanks for your comment, I left a longer response to “M’s” comment below. I hope it helps to clarify what I meant in my comment. Although my son happens to have been born with Down syndrome, and these posts are based on my personal experiences in parenting him (and over a decade of working with teenagers and their families as a student minister) my comment wasn’t meant to be disrespectful, or hurtful in any way. I enjoy learning, and not an expert by any means, so when I’m wrong about something, I don’t mind people pointing it out to me at all. It helps everyone. And in this case, I’ve never heard of children who are autistic not enjoying playing with toys of some kind, and some way. If this is the case, I want to know. Thank you for taking the time to write your comment. I really appreciate you giving me feedback on my post. I’m learning more and more every day, and I never mind someone helping me learn more about the special needs community. First, I want to deeply apologize for offending you in any way. It sounds like you are a first time visitor to our site, and new to our story. Those who have been following our story since we started this site know I am extremely careful about the words I use, and first very hard to break stereotypes, and over-generalizations. So it concerns me greatly that anything I’ve written could be interpreted as hurtful or disrespectful; or cause you to think any less of what we are trying to do. So I hope you will forgive me. Like I mentioned though, I’m always learning, and if I’m wrong, I’m sorry. Would you mind sending me some relevant articles and research that could help me to learn more about what you mentioned above? After you left your comment I did some additional research (and talked to my wife who is a pediatrician) and I wasn’t able to find any information about children born with autism flat out not enjoying toys and playing with them. And if that is true, it’s important for me to know. I am an advocate of all people, not just people born with “special needs.” I have a strong sense of value on human life, and so I’d never want to disrespect or hurt any group of people. As you said that comment was more of a figure of speech than anything else, and not meant to offend anyone (sense my thought is that only alien children wouldn’t want to play with toys, since every kid I’ve ever met has liked toys in some way, shape, or form. No worries- I just am really sensitive about the word weird since I have a “weird” kid who does a lot of jumping and pacing. I guarantee kids will be calling him weird at least by middle school. We all have our things and issues though so we can’t really take offense by ANYthing anymore, right? Or everything will drive us nuts. I don’t have any articles to back up my statement. I can tell you though one of the first questions we were asked at his eval was “does he play with toys?” and the second was “does he play with toys appropriately” I know one family where the kid never played with toys but sure likes to play with toilets. So if you consider a toilet a toy, then yeah, he plays with toys. So I’m sorry if I came off harsh and I understand you didn’t mean anything harmful by it. I’m just a mama bear when it comes to my kids. 🙂 I also have a son who was born with a cleft lip/palate so I have 2 with special needs. I will continue to read your blog. Sorry if I hurt you in anyway. No worries, I’m a daddy bear, so I know right where you are coming from. I can hardly believe it, but I’ve worked with teenagers and families for over a decade now and I know one thing to be true, kids can be very mean. Not just to kids with “special needs” but to all kids. I think it’s so important for families to be closely connected to other families (through church, school, etc….) and that other kids get a chance to get to know our children and can develop a relationship with them. I’ve heard countless stories about children born with special needs who are very well liked and have a very large group of friends in middle school / high school. But developing those roots, and connecting with peer / support groups are key. I can see how you would take offense to the comment. I have loved ones who have children with Autism, so I know how difficult it can be. My son has sensory dysfunction, so my son shares some of the difficulties as one with autism faces. I preface this so that you know that I am not “siding” with anyone. I don’t think that Noah’s dad wrote the one comment out of disrespect for anyone. It is a very innocent statement perhaps if taken out of context would seem insensitive. If you have read most of what this man have written then you should know that he has shown nothing but love for everyone and not just those in the Down Syndrome community. Like you said, we should stick together and given others the benefit of the doubt. and both posts say it much better than mine!! Good to know you know my heart on these sorts of things. I’m a pediatric OT, and I work with a 5-month-old boy with Down Syndrome. His parents actually came across your #8-light up wand a couple months ago and it has become a favorite therapy tool of mine. It was the first light source that truly caught his attention, and he began to track it almost immediately (this was at about 3.5 months). Your entire list is great. I’m a big fan of objects, like the soft piano you have listed, that can be used as visual stimulation during tummy time, or for an adult to hold vertically during therapy ball exercises. I’m also a mother to a 16-month-old son and have many of these toys for him. Great list for children of all abilities, Noah’s dad! Thanks! That’s so awesome! It’s so cool to hear about an OT that goes the extra mile for pro-active parents like you are doing. Great job! I’m assuming you’ve seen some of the many different therapy videos we’ve posted on this site (there are tons of them.) And we found out about those light “wands” from our OT and they have been very helpful. I’m glad to hear about how you are using them. We’re about to post some pretty exciting material from the Dr. you came up with the treadmill training, including some document for therapist to download. I’d be interested to here your thoughts. What part of the country are you in? And how long have you been an OT? Our son is 2 & 1/2 and loves his Silly town too, it’s a great toy! What you have done adopting him is very admirable, i wish you all the best on your fabulous journey ahead. Have a joyful xmas together. Another great idea is the SParkling Sea Soother by Fisher Price. It has lots a bells and whisles to stimulate interest and has 4 different sounds that play for over 20minutes. Olivia loves the music from the mobile but it would only last for 45 seconds. How long have you guys been doing signs? How is it going? Also I’d be interested to learn more about those vibrating animals…those sound really cool, and I bet Noah would like them! I believe Melody is referring to these. At least they’re what we tried. Alyson wasn’t a huge fan, but I’ve heard that it works for others. BOOKS BOOKS BOOKS. Little music maracas. A toy with a mirror. I bought Amber a toy you fill with water, a water mat, and has little floating fish in it. So when they play on their belly they can use their hands to swoosh the water around. You were right about anthing that makes sound or lights up. Hopefully the sound isn’t too annoying for adults. I took the legs off a music play table like you showed for when she was learning how to sit. She could still play with it 🙂 she loves a singing elmo we have. And she LOVES this mat we have that makes music when you step on it. She crawled to it and would sit on it to make music. She still loves it. We LOVE #10, baby blocks. It is a great first toy for several reasons, many that are listed above, but in addition, it teaches cause and effect as well. The child learns that there are toys in the box and he can also learn to put it in and out of the box (purpose) as well as purposeful release. Here are a few others that we have found to be winners with Alyson. Emily is Alyson’s favorite toy from birth. She loves looking at faces, but beyond that it has been useful for her gross motor skills. We will have her hold on to the rings and pull on the doll in the other direction, so it is used to strengthen her muscles as well as teaching her to bring her hands together (by having one hand on each ring). There are multiple textures throughout the toy, so she is getting a lot of different sensory input. The counting pig is another great development toy similar to the blocks (#10 above). But our main goal of the counting pig are the coins. The coins are the perfect shape to introduce pincer grasp, as the child learns to hold objects between the thumb and index finger. Purposeful release as well cause/effect is learned through inserting coins in the slot. Another great development toy is something similar to the Busy Poppin Pals. Lots of companies make similar toys to this, but you get the idea. Child learns that by pressing a lever a toy pops up. Also, different hand movements are learned. All kids loves balls! Especially spiky balls adds extra sensory input. 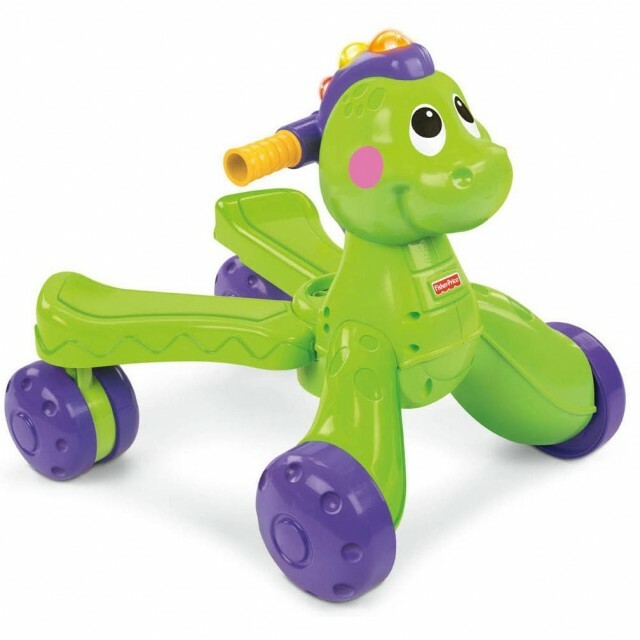 For us and our older child, we didn’t have much success with the walker similar to the stride to ride Dino. The clasp that allows to switch it back and forth from a ride on to walker was really difficult to maneuver without a tool of some sort and Kyle had a difficult time banging into the walker on all sides. We had much more luck with this walker (more room for his legs to walk). I should add that Kyle does not have DS and was super mobile, so there might be a difference in this aspect as far as support goes. PS Board books are always good! 🙂 Alyson loves looking/reading books. Younger babies will thrive on black and white books, the older will want more colors. Textured books are great for development. Thanks to this list, we got our daughter the #1 item, the Fisher Price snail. She loves it. You are right, any item that makes noise and lights up is a winner. I am anxious to get the Tickle Monster next. I regret that I’m reading and commenting on this post so late after Christmas, but I just have to say that toy #9 is a miracle toy! My little guy, who’s 17 months old with Down syndrome, stood up for the first time ever on this particular toy at around 9 months. Now he stands in front of it without support and claps for himself while watching in the mirror. If you buy anything for your child with special needs, buy this toy!!! Ours is a hand-me-down from a friend, so I’m not sure where it can be purchased. #9 is definitely a must. That was the best gift my daughter received and she got the most use out of. She has been playing with it for 2 years now. I would also add that a standing keyboard is a great gift idea for a child with Down Syndrome. I agree. My son loves all toys like this. Musical, light up, sing-a-long, etc. Great choices! I remember Gary liked bells, noise(soft rather than loud), lots of color, cute little fabric books, number toys, the popcorn push toy (today still loves procorn) the counting toy with the objects that you move from one end to the other, it makes noise, all the farm and animal toys, and Teddy. There were not as many options when he was little, as he is 49, but he was happy with everything. With all of these toys, you have to add your love, time and closeness. The love and interest of the entire famiy has been priceless and rewarding for all of us. He is loved and knows it. 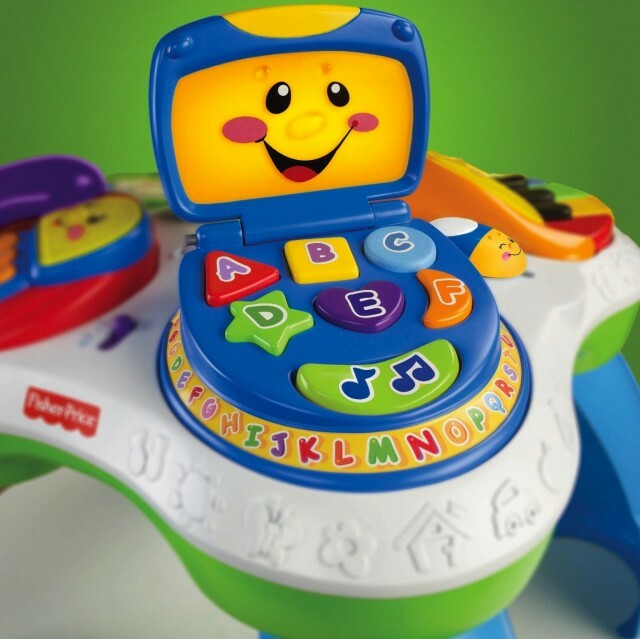 Fisher-Price Precious Planet Kick and Play Piano and the Multicolor LED Flashing Wand, thank you so much! If she does not have a boppy pillow it was probably one of the greatest helps to us with Noah when he was first born. It helped us work on tummy time, as well as supported him while he was eating. The flashing wand is an excellent gift as well, as a child’s first developmental milestone should be tracking and that toy is perfect for working on that. There is also research showing that kids who use kick toys like the kick and play piano walk earlier 🙂 So way to prepare this child for a bright future. Have fun meeting your new grand baby 🙂 She will be quite the joy to the family. My parents can’t get enough of Noah and love to cheer him on as he develops. wow nice gifts ideas for kids…they will happy to play with this toys.. I disagree with comment # 1 as children with down syndrome age they will still really enjoy toys made for younger children. A 3-4 year old who has DS will likely still be thrilled with toys for a two year old such as push toys and dumping toys on the floor and puttingg them back and dumping them over and over (cause and effect will still be developing). A five -six year old with ds will enjoy toys for a three year olds, like beads attached on wire bent in crazy shapes and a block shape sorter. A child with DS will be able to use any age appropriate toy, but remember that it might need to be modifed and require strict parent involvement. Many children with DS still put objects in their mouths at 4 and 5 and they can choke (marble raceway, playdoh, light bright). Also children with DS will likely develop their imaginative play and fine motor skills a little later than typical developing peers, so a make sure not to choose a gift that will fustrate or be boring. like a typical developing child at age 3-4 will love a giant 20 piece puzzle while a child with ds may not enjoy this till they 7 or 8. on a final note, when choosing a gft for children with DS you need to choose both gifts that they can play with unassisted, such as push toys or like a grocery cart or baby stroller another example would be a musical toys like drums or shakers. If choosing a gift for parent involvment try to choose one that will help develop use of hands, eye coordination, and imaginative play. Choose the gift that is just a bit harder than your childs level. so if you child just started picking up objects with their pinher fingers other than their whole hand, blocks will help them develop coordination , but stringing beads with two hands may be to hard . If your child is just throwing blocks and not building yet,, go with their idea a bean bag throwing game would be fun and develop arm skills. As with all children, development and likes will dffer and the best toys are ones that can grow with your child. I have to say that I disagree with the spirit of what Victoriakolo is saying. Perhaps I misread the comment. I think to some degrees ALL kids do enjoy toys targeting a younger age group. My 7 year old niece, 5 year old nephew and my 3 year old son still have a great time playing with toys that I pull out for my 1 year old DS daughter. However, I don’t think a 3 year old DS will only be able to adapt or enjoy a toy designed for a 2 year old, etc. Remember, as with all typical children, there is a spectrum when it comes to kids with DS. Some will be more advance than others. So far, my 16 month old DS daughter has no issue playing with toys designed for her age group and she still finds joy in playing with her brother’s toys as well. Is she playing with it the way it is designed? Perhaps not, but that does not mean she will not find thrill or enjoyment in it. 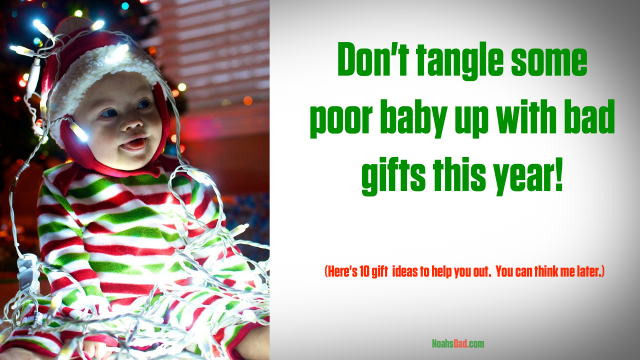 As far as gift giving is concerned, isn’t that what we’re most concerned with? Also, don’t be fooled by the fact that they are not playing with the toys in the manner it was designed to play. That does not mean there is no merit in it. They are building imaginative play skills in there, they are working on fine and gross motor skills, or they could be modeling life situations in which they can be building on their cognition and speech. I understand that Victoriakolo has good intentions in her comment, I just felt that it read in a way that doesn’t do our kids any justice. 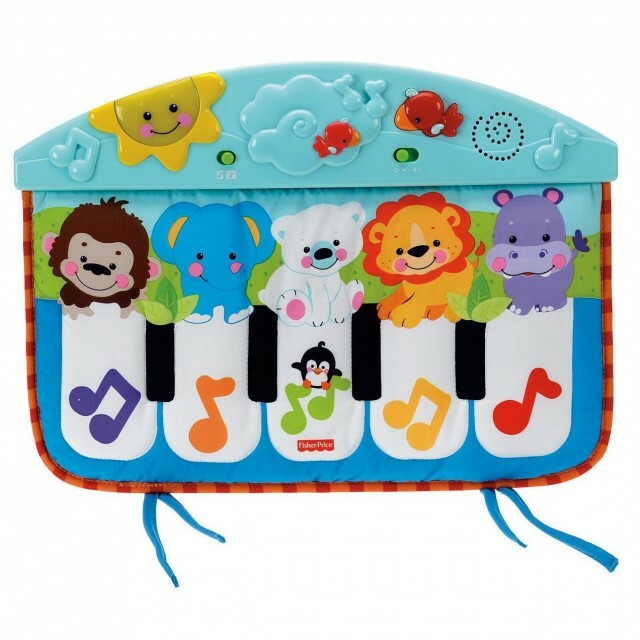 One of the first purchases for our grandson was the kick and play piano which now is mostly set aside (I tried to replace the batteries but the screws refused to come out-???) while he moves onto other toys. He’s over a year old now. His first Vteck was a roll to crawl ball and it still interests him. A number of his toys are V-Teck. Wish we had gotten our grandson the Stride to Ride Dinosaur. For his first birthday he did receive one and he placed his feet on the Dino’s back while his little cousin pushed him around the floor. It was so cute! Tropical Fun Drop ‘n Spin by Bright Stars is catching his attention along with Sliding Songs and Bead Maze by Vtech. Another toy he likes is an ’emergency vehicle dashboard’ with very realistic bells and whistles. He likes to pick toys up, tug on them, turn them over and drop things on them. Just got him a baby soft plush Rubik’s cube for him. He really likes to look things over well. He’s always drawn to light so the wand looks like a great purchase. Thank you for all of the toy tips. What a great list! I have to admit buying gifts for my son who has multiple special needs sends me into a panic. He is very developmentally delayed, so we can’t follow the age recommendations on the box. He has Epilepsy so we have to be carefu about flashing lights and he also has CP so standing/sitting/ride-on toys don’t work for him. We try not to sweat it and forced to be more creative and consult with his therapists to find the best stuff for him. This is a great list! We just found out that our son will be born with Down Syndrome and I’m re-evaluating some of our toys and baby gear that are from our first 2 children. It seems most will work just fine, but our new little one will probably benefit from several of your suggestions. I’m sorry that you are getting multiple comments. That is strange? Everytime someone leaves a comment you get 4 emails? That is strange. Thank you so much! This will make Christmas so much easier this year! My little one is 16 months old and I am just lost at what to get. It was so hard last year he just wasn’t doing anything yet. I felt sad trying to buy for him. I got a lot of soft stuff it didn’t seem right to get things for a six month old who couldn’t play with it yet. At his first birthday I didn’t care we just went for it! lol We can’t wait for this Christmas! Tyler is the youngest of four. Eric 14, Meagan 10, Aaron 5. He has spoiled us so much!!! 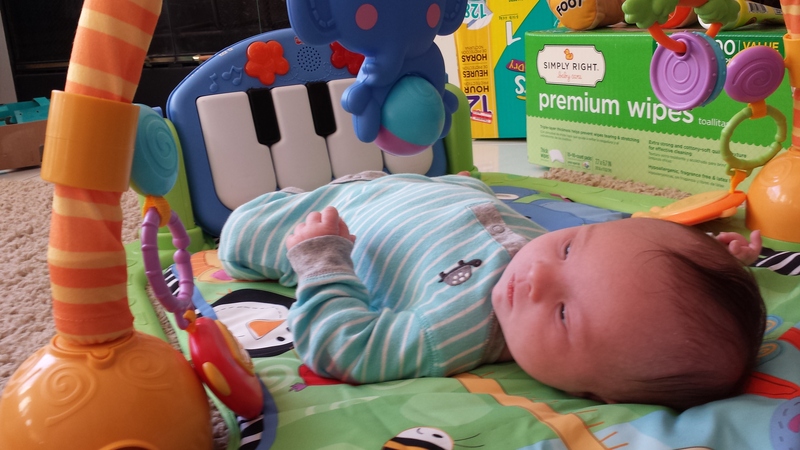 My baby loves the Fisher-Price Discover ’n Grow Kick & Play Piano Gym. I love watching him kick his little legs to the music. He is 8 weeks now. If anyone has the Fisher Price Little Superstars Sing-a-long Stage they are not using anymore please let me know. I will gladly buy it from you and pay shipping. Amazon wants a fortune! That is so wrong. 1. Children only need a few, high quality toys available to choose from. 2. 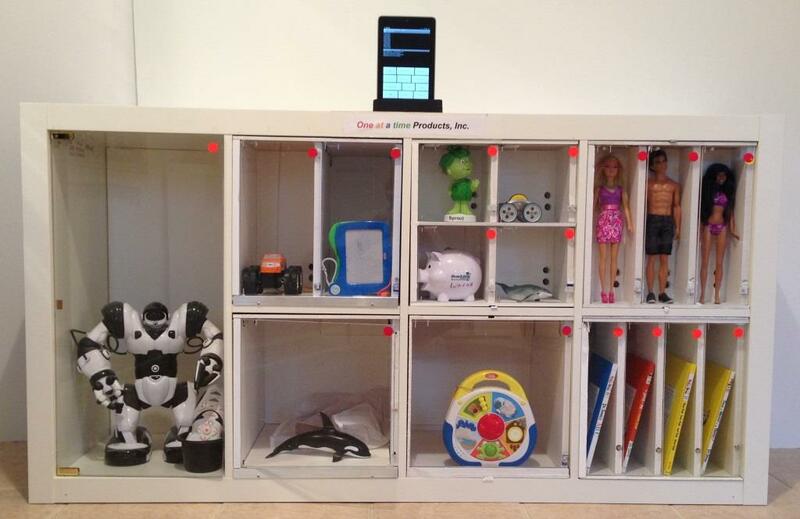 Children want to be able to SEE where the toys are when they go looking for one. So make sure you use clear plastic bins or doors. 3. Each toy should have a specific place or “home” where it belongs when the child done playing with it. 4. Kids should never have to face the daunting task of picking up dozens of toys at once. 5. A toy in the hand or on the floor that the child is done playing with should still have “value” in exchange for a new toy. I built the One at a time toy cabinet for my grandson several years ago. It meets all 5 of these basic criteria, especially since it requires him to put a toy back before being able to get out another toy. Now I’m experimenting with making the cabinet electronic and expandable as children age and gets more toys. Sorry, I forgot the image. Thank you for the list. I have trouble finding some good toys for my son who has Downs, had a stroke and vision problems. He loves music and light up toys. Do you know of any other websites for Downs? My son will be 4 years old In Feb. and he just now is pulling hisself up to standing position. No interest in crawling. Thanks for your posts. These are great toys for all small children. But watch out for that snail. It’ll start giggling at night as it supposedly quietly sleeps in the other room…guaranteed to freak out grown-ups of all sizes! I truly love your gift of your stories to the rest of us. And Noah is so darn cute!